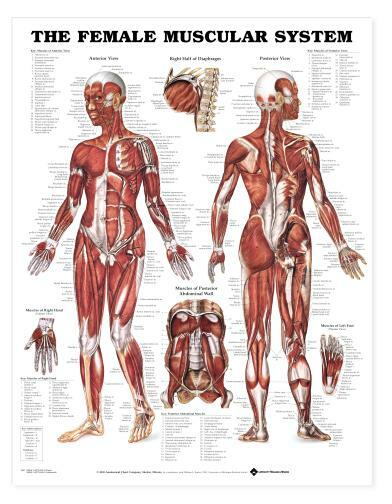 Size is 20" W by 26" H. A female version of the popular Peter Bachin Muscular System chart! Shows anterior and posterior view of the muscular system. Also illustrates right half of diaphragm, muscles of posterior abdominal wall, muscles of the right hand (palmar view) and muscles of the left foot (plantar view). Size is 20" W by 26" H. Classic illustrations by Peter Bachin. 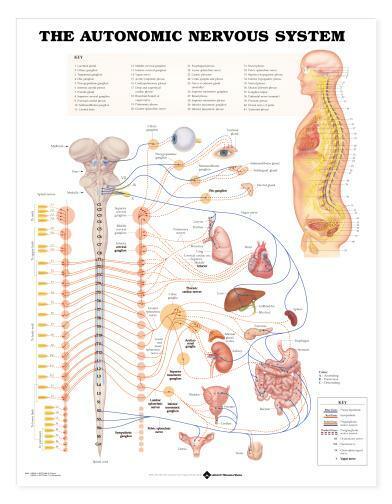 Illustrates nerves in the body, brain, midbrain, medulla oblongata and spinal cord. Also shows spinal meninges, intercostal nerves and sagittal section of female pelvis. 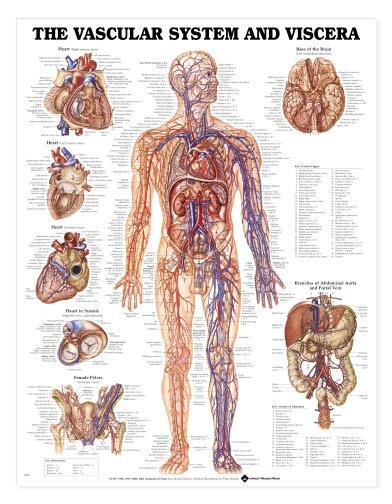 Size is 20" W by 26" H. Shows autonomic nervous system, including sympathetic and parasympathetic nerves. Size is 20" W by 26" H. Shows system on body. Illustrates heart (right interior, left interior, and posterior views), heart in systole, female pelvis, base of the brain, and branches of abdominal aorta and portal vein. 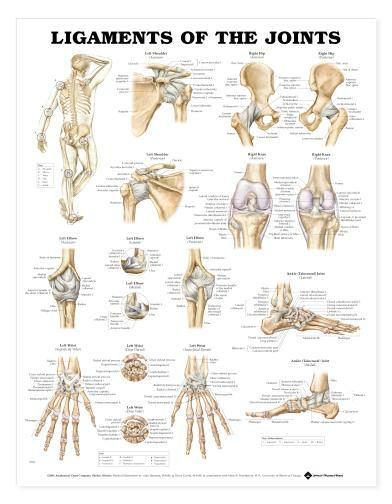 Size is 20" W by 26" H.Shows general hip and knee anatomy, as well as hip joint capsule, acetabulum, brusae, ligaments of the knee, and detailed anatomy of a tendon. 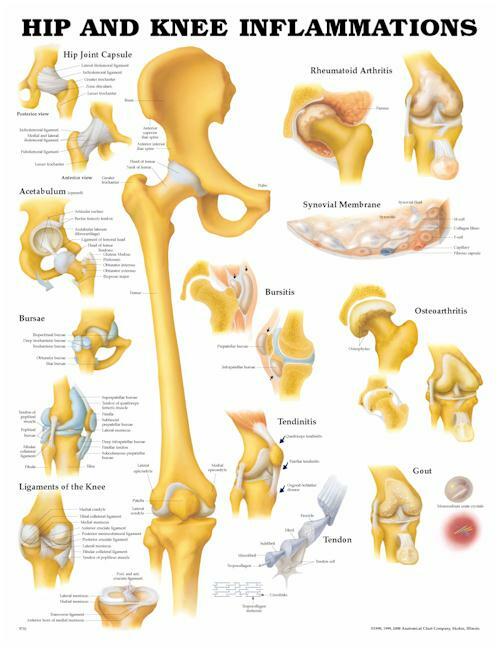 Illustrates rheumatoid arthritis, synovial membrane, bursitis, osteoarthritis, tendinitis, and gout. Size is 20" W by 26" H.Shows muscle and tendon anatomy of the hand and wrist. Illustrates dorsal view of bones and palmar view of carpal bones. 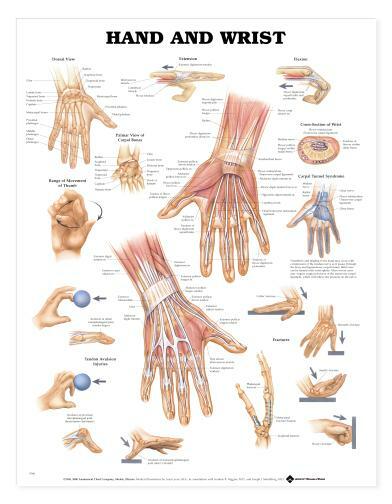 Shows extension, flexion and range of movement of thumb. 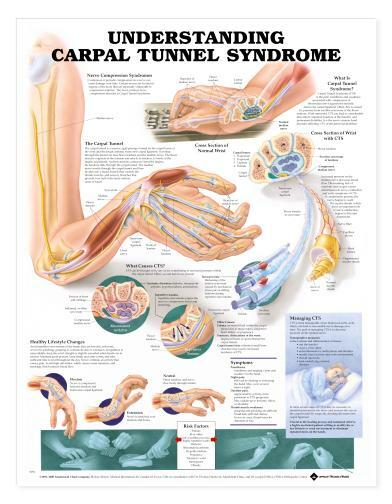 Size is 20" W by 26" H. Defines Carpal Tunnel Syndrome (CTS) and nerve compression syndrome. Shows the Carpal Tunnel and cross sections of a normal wrist and one with CTS. Causes, risk factors, symptoms are listed. Management techniques and healthy lifestyle changes are also covered. Size is 20" W by 26" H.Shows location of various joints. Provides anterior and posterior views of the left shoulder, right hip, right knee and left elbow. Also illustrates lateral and medial views of the left elbow and ankle joint. Shows superficial volar, deep dorsal and superfical dorsal views of the left wrist. 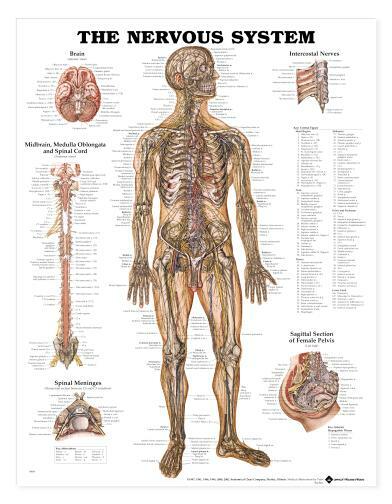 Size is 20" W by 26" H.Illustrates foot and ankle anatomy including bones, muscles and tendons. Shows medial, frontal, lateral, and plantar views as well as a cross section. 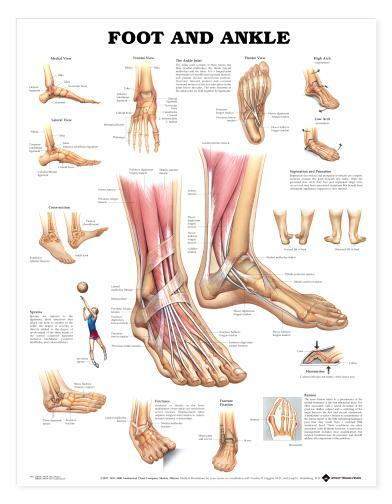 Illustrates supination and pronation, hammertoe, bunion, sprains, fractures and fracture fixation. Size is 20" W by 26" H. Shows right lateral view of the vertebral column with markings to show location of atlas & axis, cervical, thoracic & lumbar vertebrae, and sacrum and coccyx. 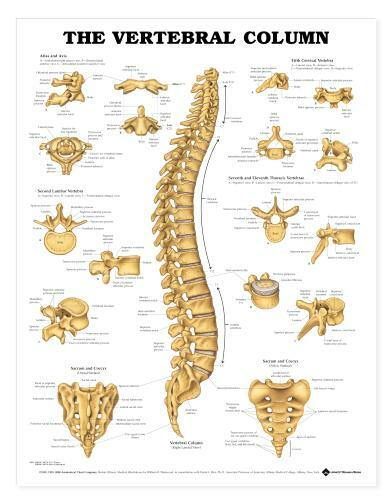 Provides various views of atlas & axis, second lumbar vertebra, fifth cervical vertebra, seventh and eleventh thoracic vertebrae, and sacrum and coccyx.